Strip planting perennial peanut into bahiagrass reduces establishment costs and allows the grass to be harvested for hay during legume establishment. The author is a forage specialist at the University of Florida’s North Florida Research and Education Center. Growing forage legumes in the southeastern U.S. can be challenging. The combination of warm weather, high moisture and sandy soils provide a perfect environment for a variety of crop pests and diseases. The premium hay market in the Southeast, however, represents a multimillion dollar industry creating opportunities for hay producers. Perennial peanut (Arachis glabrata Benth.) is a forage legume well adapted to the Southern Coastal Plains and Florida Peninsula. Its nutritive and hay market value is similar to alfalfa. Perennial peanut grows well in sandy soils and develops a strong root/rhizome system that enables this crop to tolerate a range of harsh conditions. Hay yields in dryland annually range from 3 to 6 tons per acre, distributed in three harvests (usually June, August, and October). Once established, perennial peanut is a long-lived perennial crop. When well managed, it persists for more than 30 years. Because of its adaptation and ability to fix atmospheric nitrogen, production costs of perennial peanut are lower than other hay crops. Perennial peanut is best suited for well-drained sites. It tolerates the mild winter of the Southern Coastal Plains, areas south of 30 to 32 degrees latitude. In a variety trial performed in Stephenville, Texas (located north of the 32 latitude), the only entry that survived the winter was a more cold-tolerant variety named Latitude 34. Have soils tested before planting and apply fertilizer based on state extension recommendations. Perennial peanut has a target pH of 6.0. Perennial peanut is planted from sprigs (root and stolon pieces). It takes 80 bushels of sprigs per acre in order to properly establish a field. One acre of well-managed nursery produces enough planting material to establish 15 to 20 acres of perennial peanut. Several varieties of perennial peanut are available for growers in the Southeast. Florigraze is perhaps one of the most planted varieties, but its productivity has been declining recently due to the presence of a stunt virus. Newer varieties such as UF Peace and UF Tito are more productive than Florigraze and are good options for hay production. Ecoturf is not as productive as UF Peace and UF Tito but it is well suited for grazing. Among the perennial peanut varieties, Ecoturf is a prolific producer of roots and rhizomes. It also has a prostrate growth habit, which enhances grazing tolerance and adaptation. 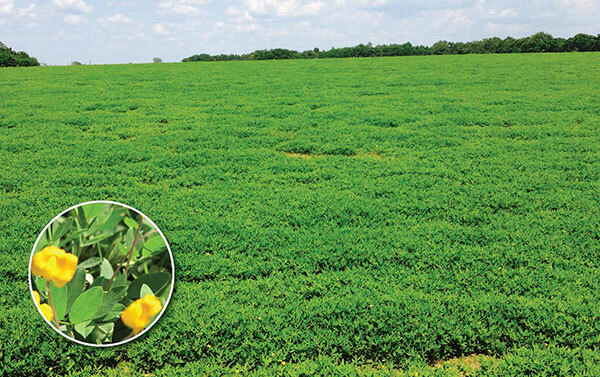 Perennial peanut forage has in vitro organic matter digestibility (IVOMD) ranging from 67 to 73 percent. The lowest digestibility is usually observed in the variety Arbrook, but it’s still high compared to other warm-season forages. The crude protein value of perennial peanut ranges from 13 to 18 percent, though Arbrook can sometimes be lower. Establishing in early spring (March or April) reduces weed competition and extends the establishment year growing season; this allows the perennial peanut to develop the roots and rhizomes before winter. Applying glyphosate prior to planting helps to reduce weed pressure. A prepared seedbed often leads to better establishment than no-till planting; however, more weeds will likely be present at the initial stages. Weed control is critical during the establishment phase. Imazapic applied pre- or postemergence for broadleaf weeds and clethodim for grassy weed control are the preferred herbicide options for perennial peanut establishment. Keeping the sod clean helps to rapidly establish this forage. For more information on weed control, refer to the publication Weed Control in Perennial Peanut (https://edis.ifas.ufl.edu/wg216). For producers interested in getting started with perennial peanut, the Perennial Peanut Producers Association (www.perennialpeanuthay.org) provides a list of rhizome producers and commercial sprigger services. Establishing a smaller area at the beginning can save costs on the establishment. This area can be used as a nursery and provide planting material for future expansion. Integrating perennial peanut into bahiagrass pastures is a way to enhance cattle productivity and reduce nitrogen fertilizer inputs. Because establishment costs are high and early growth rate is slow, we propose the strip planting of perennial peanut. Using this approach, the producer establishes 50 percent of the area with 9-foot wide strips of perennial peanut intercropped with 9-foot wide strips of bahiagrass. The width can be adjusted to the size of the sprigging equipment. Match the grass strip width to that of the farm’s haying equipment. During the establishment period, the grass strips can still be used to produce hay. We recommend not to graze cattle on the field until the perennial peanut is established (the first one to two years). Using this approach, we established a trial at the University of Florida – NFREC in Marianna, Fla. We continuously stocked perennial peanut/bahiagrass pastures and contrasted with bahiagrass pastures in monoculture. The preliminary results from the first year are promising. Steers had twice the gain on the mixed perennial peanut/bahiagrass pastures compared to the pure bahiagrass. We will continue the study for two more years in order to obtain long-term results for cattle productivity, persistence of the perennial peanut, and nitrogen inputs. Perennial peanut is one of the few perennial legume options for the Southern Coastal Plains and Florida Peninsula. It adapts well to the region and provides a high-quality source of hay for the horse and dairy industries. Perennial peanut can also be integrated into grazing systems to enhance cattle productivity and to reduce inputs of nitrogen fertilizer. Strip planting perennial peanut reduces establishment costs and allows the use of the grass component during the establishment phase. Integrating perennial peanut into a pasture system presents an option to establish a sustainable grazing system for cattle producers in the far southern regions of the U.S.
Perennial peanut varieties differ in production and forage quality. This is a field of UF Peace in North Florida. This article appeared in the February 2016 issue of Hay & Forage Grower on pages 8 and 9.